Athens, Georgia has a long history of producing some great musicians and music, known for being the birthplace of groups like the B-52’s and R.E.M. as well as the adopted home of the Elephant Six Collective. One of the latest bands to emerge from the storied Athens scene is Grand Vapids, a quartet whose 2015 debut Guarantees features ten tracks of Pavement-like, laid-back guitar rock. There’s also something about this album that recalls for me the more melancholic music by Minus the Bear, but while that band seemed to delight in throwing listener expectations out the window, Guarantees is remarkably consistent in terms of what it provides for the listener. It’s also almost soothing, with plenty of downright sleepy songs scattered among the more driving, loud and gnawing tracks. Opener “Secret Sin” is one of the latter, with a crisp, punchy drum rhythm and a chugging main guitar riff complimented by a resonant baritone vocal. Brief additions of background sound – a twinkling secondary melody here, a distortion-heavy passage there – accentuate the song’s tight composition and offer some variety alongside the omnipresent drone of the main instrumental parts. “Adequate” continues in much the same way, with a burpy, grinding bass establishing the underlying chord structure before the guitar adds much warmer sonic coloration. The song’s sweeping chorus provides a striking contrast to the sparse verses, and the piece culminates in an fuzzed-out blitz of sound before rapidly fading away to nothing. Overall, the auspicious Guarantees is a confident release that acutely demonstrates the songwriting and technical ability of the persons involved in its creation – it’s really the craftsmanship on display here that sets this album apart from numerous other, sometimes forgettable indie rock groups. 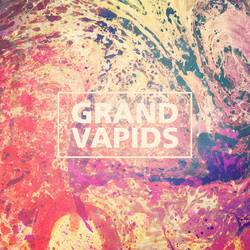 Grand Vapids don’t set out to be the most polished or “hip” band on the block (though they do sound polished and kinda cool); instead, they let their songs speak for themselves while leading the listener into a syrupy dream in which the cares of the world slowly fade away. Vocals on the album, performed by the duo of McKendrick Bearden and Austin Harris (who previously collaborated in the band Androcles and the Lion), have a world-weariness to them which makes them more relatable for the average listener, and despite the presence of some more rousing songs early on, down the stretch this debut album captures the carefree laziness of a summer afternoon. I got the sense from this effort that Grand Vapids can pull off almost anything they want to do musically, and I’m certainly curious to see what the future will hold for this capable group. Posted May 26, 2015, 1:11 p.m.